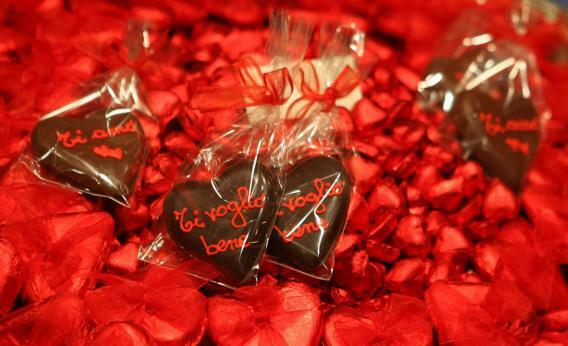 Chefs hate Valentine’s Day, so maybe just get chocolates for your love. Most chefs hate Valentine’s Day. The staff is grumpy because it’s (next to Mother’s Day) the least-tipped holiday, cooks are grumpy because we cram more people into the space than we can possibly feed, chefs are grumpy because we’re relegated to smaller menus with idiotic little gimmick dishes that somehow are supposed to convey love, and diners are not only grumpy, they’re outright crazy. Working on Valentine’s Day means seeing the kind of people one doesn’t see the rest of the year. It means that the smell of flowers wafts into the kitchens and makes even the most hardened cooks want to kill someone. It means saccharine sweet proclamations in front and the weeds in back, owing both to unfamiliar menus and stupid Valentine’s Day dinner requests. The couple asking for a special meal to celebrate their sixth anniversary. “Sweet,” I think. And then I look at the request. When said couple met at our place years ago, they were happily dining omnivores. Now they’re raw food vegans who eschew gluten and do not eat high-carb vegetables such as potatoes or even gluten-free flour. The guy who wanted to propose to his girlfriend and asked me to hide the ring in the main course: a solid slab of seared foie gras on a bed of microgreens. When I suggested the dessert course, he told me that he expected “to get dumped or laid” and wanted to make it quick. Countless requests to draw hearts on things like steaks, pancakes (PANCAKES? ), or to form a chicken breast in the shape of one. The guy who took his girlfriend out for dinner and then faked a heart attack because he couldn’t afford the check after ordering an $800 bottle of wine with his $250 prix fixe. The girl who drank too much at dinner and then barfed into the restaurant entrance. At 8 p.m., right as the rush started. The guy who took his girlfriend out for Valentine’s Day and ran into his wife, who was being taken out by her boyfriend, leading to a fight between two scrawny accountant types in the back alley. 18 mini-cakes spelling “I love you honeybuns!” when arranged properly. Yeah, I love Valentine’s Day.